What follows is a taste of what readers can expect from the book. Ideal present for the upcoming Christmas season. The multiple lines of evidence which do exist are simply evidence that the world is warming, not proof that the warming comes predominantly from human activity. The supposed proof relies entirely on computer models that attempt to simulate the earth’s highly complex climate and include greenhouse gases as well as aerosols from both volcanic and man-made sources – but almost totally ignore natural variability. Another data point within the innumerable discourses on the post-modern assault on the Age of Reason. Problem is, very few representatives in Government appear to respond to these, and for some reason are swayed by such notorious and extremist figures as Hans Schellnhuber. “some reason” ? Look at Dr. “John” Schellnhuber’s CBE, awarded personally by Her Majesty, Berlin Embassy, 2004. Of course some subjects may smirk at a Commander of the British Empire (and all that), while some others line up for more titles. under the setting sun of that empah…. Amazing to what lengths corrupt academics, politicians and businessmen will go in perverting science in support of a lie, in order to advance their failed ideologies. There’s that TOTAL LACK OF EMPIRICAL EVIDENCE to support the warmist anti-CO2 agenda, yet again. You ask and ask for empirical evidence that atmospheric CO2 causes warming, but no-one ever seems to be able to actually produce any. Not on this forum, or any other forum. The alarmists “rant and rave” that they have all this “evidence”..
.. but its never there. I am betting that SebH will not read that book. Uha, just noticed I was called out by name again. You are correct, I will not read such a book, even if Pierre decided to send it to me as a christmas present. I googled the author and not one peer reviewed paper from him comes up. Only climate denial stuff … so no, won’t read that book, I read enough of this stuff from you guys on this blog. As the author, I admit I’ve never published in climate science. But I’m a PhD in physics who’s published in other areas, and I’ve spent a lot of time reading the lengthy (1,000+ pages) IPCC reports and numerous other climate science papers. You should read the book, as it argues the case for climate change skepticism by examining other topics such as evolution, dietary fat, vaccination and GMOs. Only climate DENIER here is YOU, seb-troll. You DENY that the climate changes NATURALLY in the past, and that we are currently at a cool period in the Holocene, just a small bump above the coldest period in 10,000 years. You DENY that the tiny changes since the LIA are purely NATURAL, and actually insist that NATURAL change has stopped and been supplanted by human caused change..
.. but are totally unable to present one bit of real scientific evidence to back up your mindless conjecture. Further to John Christy’s real vs model graph shown above, I just now did a quick comparison of snow cover data with the UAH temperature data. The UAH temperature axis is upsidedown so that the peaks can be more easily lined up – which they do very well indeed. The heights of the peaks in snow cover will vary depending on moisture availability, but their locations line up precisely. If anything this suggests UAH is too warm since snow cover has been trendless since the late ’90’s. I think I recall that the UAH series warmed up a bit when they went from v5.0 to v6.0. Nevertheless snow, which melts at 0 C irrespective of adjustments or models, shows pretty conclusively that CAGW is not happening. I think I recall that the UAH series warmed up a bit when they went from v5.0 to v6.0. The ONLY atmospheric warming in the last 40 years has come from two ocean release events, seb..
Apart from the 2015/16 El Nino transient, there has been NON WARMING since the 1998 El Nino. 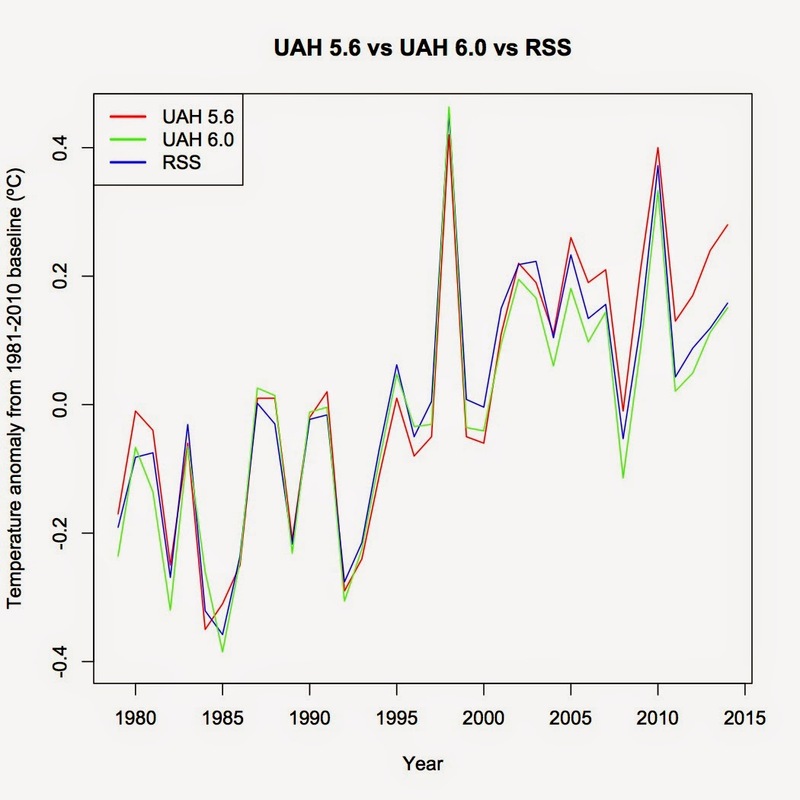 UAH Year-to-date temperature for 2018 is less than for 2002. And as you also know, there has been basically ZERO WARMING of the oceans in the last 60 years.. about 0.08ºC according to NOAA, a tiny squiggle next to the COOLING during the Neoglaciation. NH winter snow CONTINUES to increase. I know for a fact that you are almost always wrong. It’s so predictable that one can almost assume you are wrong whatever you say. Sorry that REALITY and FACTS upset you so much, poor seb-troll. Your purposeless trolling is quite hilarious in its ineptitude and ineffectivemess. You have accomplished NOTHING since you have been here, except to show just how brain-hosed and anti-science the arrogant ignorance of the base-level AGW troll really is. .. just the headless chook ranting and evasive distraction that everyone is so used to. Seb – I just checked: you’re right about UAH in the change from v5.6 to v6.0 which was in 2015. However that suggests the correction was insufficient to bring the temperature data into line with the snow cover data. Snow can’t be fooled. Snow cover is much easier to determine via satellite than air temperature via AMSU. The latter needs processing whereas the former can be more or less read off directly. Warmists’ next challenge – to “correct” the physical constants of nature to comport with their every fantasy? I mean, since their modeled “data” doesn’t support reality anyway, might as well throw the baby out and keep the bathwater. If you haven’t seen them, you might be interested in these. It may have started with art, literature and philosophy, but it’s metastasizing to math and science. If they had their way, it wouldn’t be long before they outlawed truth altogether. Each time I see or use this graph, I hope some one will update it from 2015 to 2017. Each time I see this graph I have to vomit, since it hasn’t been fixed despite the flaws having been pointed out endless times. Having to accept FACTS is likely to cause you shock and panic. Facts are an enema to you. Chimp5 is WOEFUL against any real temperature series. Even your own link shows that the peak of the recent El Nino from SPECIFICALLY adjusted ex-data STILL barely touches the model mean. 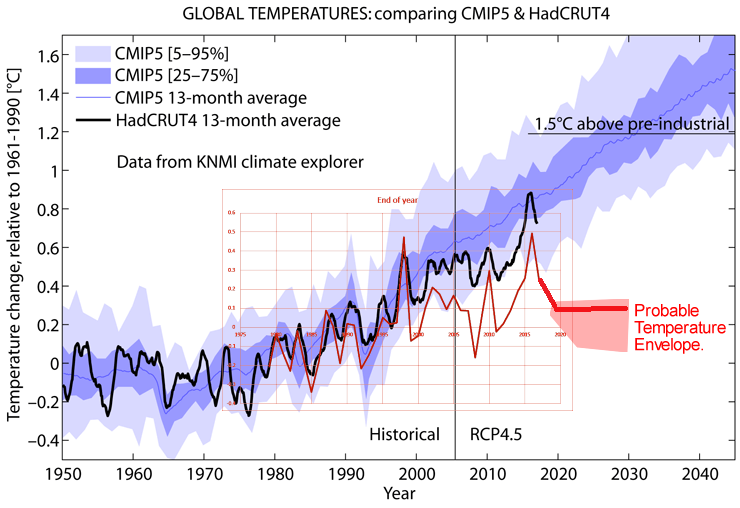 We already know that models cannot forecast temperatures accurately or precisely. We aren’t going to un-learn that. But he wants us to pretend we never knew they were garbage, and that the models are now really “scientific” after all, and we should now trust them. 2. adjusted the data to get temps to agree with the models. As before, so now – we still don’t want their stinking fake science. You are going to have to unlearn lots of things, Yonason. Or stay in your bubble an be that “Florida man” type g guy you are portraying so we’ll here and perhaps with your friends offline. “Everything is fake” while spreading fake stuff yourself is a pretty nonsensical strategy … But maybe that’s how logic works in pseudoskeptics fantasy land. Poor seb, your utter desperation at your base-level INEPTITUDE and IGNOANCE is really showing through lately. Basically everything you think you know is diametrically opposed to REALITY. YOU are the one that is totally unable to back up anything you say with any actual empirical science. YOU are the one who’s mind is trapped in a wasteland of arrogant anti-knowledge. 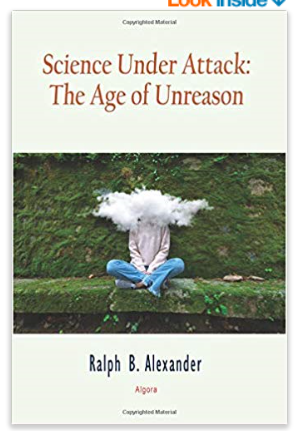 Science Under Attack: The Age of Unreason. But what few people realize is that the actual scientific evidence for a substantial human contribution to climate change is flimsy. It requires highly questionable computer climate models to make the connection between global warming and human emissions of carbon dioxide (CO2). So it shouldn’t be surprising that the models have a dismal track record in predicting the future. Most spectacularly, the models failed to predict the recent pause or hiatus in global warming from the late 1990s to about 2014. You guys seem to live in a different reality where these things are actually happened? During this period, the warming rate dropped to only a third to a half of the rate measured from the early 1970s to 1998, while at the same time CO2 kept spewing into the atmosphere. Out of 32 climate models, only a lone Russian model came anywhere close to the actual observations. Huh? They didn’t, they accurrately predict surface warming and stratosphere cooling and yeah they underestimate sea level rise (IPCC projections are lower than the actual rise). You truely live in a different reality. Huh? There are actual mechanisms involved in this, this is not a spurious correlation. If you are looking for those, I’d suggest you take a look around in your pseudoskeptic bubble. You are kidding, right? There are no sides of science, it’s only science. People like you are trying to dismantle it by inventing stuff and trying to tell a story about how actual science is a fraud. The much ballyhooed war on science typically lumps climate change skeptics together with creationists, anti-vaccinationists and anti-GMO activists. You know … the thing is you argue the same way as those groups. You use the same strategies when trying to convince people that you are right on this. And it all comes from not understanding the actual science and instead inventing your own reality. If you don’t want to be associated with those folks, then at least show us that you understood what you are arguing against. Claims like it would only be a correlation with no causation paint a different picture of you and your peers. In 2018, a Gallup poll in the U.S. found that 36% of Americans don’t believe that global warming is caused by human activity, while a UK survey showed that a staggering 64% of the British public feel the same way. I highlighted to keywords for you. Believe and feelings have no place in science. That’s for flatearthers and the like. The observations alone aren’t evidence for a major human role. Such lack of regard for the importance of empirical evidence, and misguided faith in the power of deficient computer climate models, are abuses of science. Talking like a true flatearthe: “I don’t see a curvature of Earth when I look around, therefore it is flat. No empirical evidence. And whatever you come up with is an abuse of science because I don’t understand what you are talking about anyway.” … paraphrasing here. You’re a joke and should read my book before you make such sweeping assertions. As I said in my reply (which doesn’t seem to have been published yet)to one of your previous comments, I’m a PhD in physics who’s read all the IPCC reports and many climate science papers. Empirical evidence IS lacking for human-induced climate change. The models are terrible at prediction, a fact acknowledged even by modelers who are looking for ways to improve them. My comment about the atmosphere referred to the upper troposphere, not the stratosphere – if you want to criticize, you should get your facts right first. The book actually devotes only one chapter to climate change. The other chapters on evolution, dietary fat, vaccination, GMOs and continental drift are used to argue my case for skepticism on anthropogenic climate change. WOW, seb, how did you pack so much NON-EVIDENCE and gibberish into one post.!!! Plenty of empirical evidence that the world is nearly spherical,, Do you DENY that evidence exists. WOW !!! However, you have ZERO evidence of atmospheric CO2 causing warming. You are incapable of producing a scientifically support “mechanism”, because there isn’t one. Putting the models against REAL temperatures shows how truly pathetic those models really are. that the actual scientific evidence for a substantial human contribution to climate change is flimsy. Not just flimsy, basically NON-EXISTENT, as seb-trolls total inability to produce any shows. …But correlation is not causation………. Huh? There are actual mechanisms involved in this, this is not a spurious correlation…. There was no hiatus in warming. Heat content continued to increase. That heat content is a tiny squiggle in the REALITY of time, a meaningless 0.08C in 60 years. Take your manic panic elsewhere, seb-troll. Atmospheric CO2 CANNOT be the cause of that TINY increase in OHC, because there is NO MECHANISM by which atmospheric CO2 can cause ocean warming. There has been ZERO atmospheric warming since the 1998 El Nino release, just a now decayed transient from the 2015/16 El nino. There is absolutely NO MECHANISM for atmospheric CO2 causing warming or anything, anywhere, and absolutely zero empirical evidence that it has. You are the blue guy in every way imaginable … and you don’t seem to recognize this which makes conversing with you guys so aggravating. It’s amazing how you guys see yourselves. First your arguments are the Globetrotters and now you are not the blue guy in that Dilbert cartoon. What comes next? Imagining that you are like Galileo? REALITY is starting to break through his egotistical arrogance.. Still waiting for that much ballyhooed and projected by the IPCC “Hot Spot” to show up. I see that warmists are ignoring the Tropospheric “hot spot” completely now, the one that keeps eluding detection despite heroic efforts to find it. 2)There is a 333 W/m^2 up/down/”back” energy loop consisting of the 0.04% GHG’s that traps/re-emits per QED simultaneously warming BOTH the atmosphere and the surface. – Good trick, too bad it’s not real, thermodynamic nonsense. 3)From the 16 C/289 K/396 W/m^2 S-B 1.0 ε ideal theoretical BB radiation upwelling from the surface. – which due to the non-radiative heat transfer participation of the atmospheric molecules is simply not possible. Dear Sebastian. Your attitude is very much that of a politician. If you don’t understand something or dislike the point they make, you attack the questioner. Many politicians do not realise that they are merely confirming people in their beliefs by constantly attacking them. Direct confrontation has the opposite effect, as you must have noticed by now. Only psychopaths cannot understand this. You wouldn’t want to be called a psychopath. A long course with a psychiatrist would be more to the point. !! I wonder how long the psychiatrist would last before he “committed” himself !! Hmm, so everyone here doesn’t understand what I am writing and dislikes the points I make? Or is it just my imagination that I get attacked personally all the time? P.S. : The turmoils in the U.S. (and elsewhere) happen because people let stupidity win. Don’t know why we let that happen, I just hope people in Germany realize what is at stake and don’t try to persuade or ignore them anymore, but confront them about their stupidity. You have shown you are INCAPABLE of explaining anything with rational science. all you have is you mindless zero-evidence ranting. The best you can offer is mindless AGW mantra based on NOTHING but ignorance and a total lack of comprehension of basic science or physics. You have been given every opportunity to persuade people, but when asked for actual empirical evidence of anything, you remain stubbornly mute.. almost like you were a headless chook. All you have managed to persuade anybody of is that you are basically a mental case with a pathetic egotistical arrogance that you are unable to support with any sort of actual knowledge or rational scientific thought process. The US did let Obama win.. they have rectified that error. Any turmoil remaining in the US is coming from the sore LOSERS of the far-left and the deep-state. Now its time for the people of Germany and France etc to rectify their errors. As you say, its about time they woke up and confronted the stupidity that people like you represent. Mercel and Macaroon should the first to go, then get rid of the unelected wannabee swill of the EU.